If you enjoy working with young children, you may want to consider an associate in early childhood education online. Early childhood educators work in elementary schools, preschools, or daycare centers. They teach young children essential the skills of communication, reading, behavior, and basic math. Early childhood educators guide children's emotional and intellectual development. For some children, early childhood educators represent the only positive role models they encounter every day. The Bureau of Labor Statistics projects that preschool teaching positions will grow by 10% between 2016 and 2026. Prospective students considering an early childhood education associate degree can expect to find ample career opportunities after graduation. What can I do after I earn my Associate in Early Childhood Education? Pamlico Community College ranks #1 on The 35 Best Online Associate's in Early Childhood Education Degree Programs! One of the 58 two-year schools in the North Carolina public college system, Pamlico Community College awards professional and vocational instruction and associate degrees, putting students on career paths and/or setting them up for advancement to four-year programs. This Grantsboro-based institution offers an early childhood education associate degree that readies participants to work with children from birth through middle childhood. The 66- to 68-credit curriculum explores many facets of early education, including how children grow and develop, learn language, build motor skills, and acquire information. Participants learn how to create healthy, safe, and fun learning environments; plan appropriate curriculum; use positive guidance; and establish collaborative relationships with families. The curriculum of PCC's associate of early childhood education degree blends general requirements in math, writing, humanities, psychology, and computers with major coursework across four semesters. Students must take an orientation class and typically enroll in five classes per term. The average student-to-faculty ratio is 9:1, allowing students to develop close-knit relationships with their professors. Online courses run asynchronously. Degree candidates also complete a field practicum, where they work in a class with young pupils under the guidance of an experienced teacher. Individuals generally take this four-credit capstone during their final semester. Graduates leave the program ready to step into preschools, child care centers, recreational facilities, and Head Start classrooms. PCC holds articulation agreements with several four-year colleges and universities in North Carolina, including UNC Charlotte, UNC Wilmington, East Carolina University, and Barton College, which makes transferring into a bachelor's program relatively simple. Applicants must submit proof of a high school degree or the equivalent. Some prospective students may need to take placement tests. University of Cincinnati ranks #2 on The 35 Best Online Associate's in Early Childhood Education Degree Programs! The University of Cincinnati's school of education offers an associate degree in early childhood education that holds accreditation from the Council for the Accreditation of Educator Preparation (CAEP). Conducted entirely online, this program gives students the opportunity to specialize in one of three areas: administration, infant and toddler care and education, and preschool care and education. The 60-credit curriculum takes participants through a variety of subjects, including music and art, movement, early language development, and science and math. Cincinnati was an early adopter of the web as an instructional medium; today, the university offers more than 100 degree programs through its virtual campus. Most classes use an asynchronous format, and students should expect to devote about 10 hours per week on each class. Students in the associate of applied science in early childhood care and education program complete 45 credits in the core curriculum, including both general education and major requirements, and another 15 credits within their concentration. Both the preschool and toddler concentrations require learners to carry out at least one student teaching practicum. Individuals must earn a GPA of 2.5 or higher to graduate. UC provides many services to distance learners, including access to the library and reference desk, tech support, software discounts, academic advising, tutoring, and a writing lab. Students can also join education-oriented clubs and organizations, including Students for the Education of Young Children and the Future Educators Association. Applicants must submit their high school transcripts or proof of a GED certificate. Students may transfer as many as 30 credits into the program. The University of Cincinnati is regionally accredited by the North Central Association of the Higher Learning Commission. University of Alaska Fairbanks ranks #3 on The 35 Best Online Associate's in Early Childhood Education Degree Programs! The University of Alaska Fairbanks boasts a thriving virtual campus. About a third of the student body takes advantage of the school's online asynchronous learning option. UAF's department of e-Learning and distance education hosts several degree options, including an online associate of applied science in early childhood education. This program takes a holistic approach, emphasizing the development of the entire child. UAF established its online AAS in early childhood education using standards set by the National Association for the Education of Young Children (NAEYC). The 60-credit curriculum contains some general education requirements, but 45 major-related credits dominate the coursework. Students typically take introductory courses in their first semester; go on to work through classes in child development, nutrition, safety, curriculum planning, exceptional needs, and family relations; and eventually finish two practicums. Learners typically complete practicums in a classroom with children under the age of eight under the guidance of an approved supervisor; these experiences must include both planning and lead teaching. Students in this program connect with their peers and professors frequently, and the university maintains small class sizes with an average of 11 pupils per course. Degree seekers must maintain a 2.0 GPA or higher as they move through the program, and all major-related classes must be passed with a “C” or higher. The university accepts transfer credits, but students must take at least 15 credits through UAF. UAF does not require applicants with associate degrees or certificates to submit a high school transcript. All new students must submit their SAT, ACT Plus Writing, or ACCUPLACER exam scores. The University of Alaska Fairbanks is regionally accredited by the Northwest Commission on Colleges and Universities (NCCU). Shasta Bible College and Graduate School ranks #4 on The 35 Best Online Associate's in Early Childhood Education Degree Programs! Shasta Bible College sees its mission as creating Christian leaders who “impact the world for Jesus Christ.” Most of this Redding, California institution's degree programs relate to ministry and divinity, but the school also has an education department that hosts an early childhood education associate degree online. Built around a 67-credit curriculum, Shasta developed this program in keeping with its biblical traditions. The Christian focus of this degree track readies students for positions in Sunday schools and church nursery programs or to open their own preschools. The curriculum combines theory and practice, aiming to produce leaders and administrators. Because Shasta is a Bible college, the general education requirements of its online associate of arts in early childhood education differ from those of more traditional community colleges. Students must complete 12 units in biblical literature, three in biblical interpretation, six in theology studies, and one in ministry. The major curriculum emphasizes child development, curriculum building, and preschool administration, and degree candidates must conduct three units of supervised field work. All classes run asynchronously and follow the school's 15-week semester schedule. Shasta recommends that students commit six to nine hours a week to their schoolwork for each class. The school accepts transfer credits, but students must take at least 32 credits through Shasta. The curriculum holds approval from the Association of Christian Schools International. Shasta Bible College is internationally accredited by the Transnational Association of Christian Colleges and Schools. Southwestern Assemblies of God University ranks #5 on The 35 Best Online Associate's in Early Childhood Education Degree Programs! SAGU devotes most of the curriculum in its online associate of arts in early childhood education towards general education and biblical education requirements. Students meet the early childhood component by completing six classes in children's development, children's literature, and the foundations of education. SAGU delivers all coursework asynchronously, and students must maintain an overall GPA of 2.0 or higher to earn a diploma. Applicants should provide a religious reference, high school transcripts (or the equivalent), and placement test scores. SAGU may grant students up to 45 credits based on previous work/experiences. The university also offers online learners a discounted tuition voucher, giving them a 15% break on the cost of their education. South Texas College ranks #6 on The 35 Best Online Associate's in Early Childhood Education Degree Programs! The largest institution of higher education south of San Antonio, South Texas College educates more than 34,000 students at its five campuses and through its cyber classrooms. STC offers more than 500 courses and 22 degrees through the internet, including an online associate degree in early childhood education. The early childhood to sixth grade program is one of three introductory teaching degrees under the umbrella of the school's associate of arts in education. This degree track requires students to earn 61 credits. It differs from many other early childhood degrees in that it focuses on the elementary grades and has no required courses related to the care of very young children. The degree meets Texas' “No Child Left Behind” standards for paraprofessionals. The degree plan for this associate of arts in elementary education program stretches across five semesters, and students enroll in three or four courses per term. STC hosts accelerated “minimesters” for many of its courses; these five-week terms allow students to quickly accrue the credits they need for graduation. 42 credits of the curriculum relate to general education and core requirements and 18 focus on elementary education. STC does not require a practicum experience. Degree seekers can easily move into STC's bachelor's in education program or seamlessly transition into one of the 60 universities across the country that share articulation agreements with the school. South Texas College is regionally accredited by the Commission on Colleges of the Southern Association of Colleges and Schools. Indiana Wesleyan University ranks #7 on The 35 Best Online Associate's in Early Childhood Education Degree Programs! Located in the city of Marion and affiliated with the evangelical Wesleyan Church, Indiana Wesleyan University is one of the largest Christian schools in the country. With a mission to spread the word of Christ, IWU ranks as one of the fastest-growing Christian colleges in the country; the school's popular virtual campus is one of the reasons for its enrollment boom. IWU has nearly three times as many “national and global” learners as it does on-campus students. It hosts almost 100 programs through the internet, and working professionals can pursue an early childhood education associate degree online at IWU. IWU's online associate of science in early childhood education is a cohort-based program where students progress through classes as a group, taking one course at a time in succession. The university designed the 60-credit curriculum to prepare Christians to educate children from birth through age eight as paraprofessionals; however, the program does not prepare graduates for licensure. IWU expects students to exhibit “Christ-like” behavior as they earn credits. Degree candidates must keep a minimum 2.0 GPA and earn a “C” or better in most core requirements. Students interested in furthering their education can apply 24 of the 30 general education credits earned in this associate track to a bachelor's program at IWU. Additionally, students may earn up to 18 credits by using the university's prior learning assessment tool. The curriculum takes a constructivist “Vygotsky” approach, teaching prospective educators how to support children in learning experiences based on play, inquiry, projects, and problem solving. Participants discover ways to advocate for young children, build communities, and create relationships with families – all in the name of Christ. Applicants must supply their high school transcripts or GED certificate and submit to a criminal background check. Indiana Wesleyan is regionally accredited by the Higher Learning Commission of the North Central Association of Colleges and Schools. Northeast Community College ranks #8 on The 35 Best Online Associate's in Early Childhood Education Degree Programs! A midsized, two-year school in Norfolk, Nebraska, Northeast Community College offers an online associate degree in early childhood education that takes two tracks: an applied science track for students interested in immediate employment as a paraprofessional and an associate of arts track for individuals who want to matriculate into a bachelor's program in education. Offered in partnership with other community colleges in Nebraska, the program exists entirely online. Both tracks consist of 60 credits; the main difference between the two is the number of credits allocated to general education. In the transfer-oriented associate of arts, participants take 28 credits of general ed and 32 credits in the core early childhood curriculum. Alternatively, in the workforce-oriented applied science curriculum, students finish only 18 general ed credits and 42 credits in the major core. The applied science track also includes coursework designed to prepare students for leadership positions at preschools, Head Start programs, and other child care facilities. Most professors deliver course material in asynchronously. Northeast's program requires students to spend a lot of time in classrooms, where they learn how to plan lessons and teach children under the supervision of qualified teachers. Three semesters of this four-semester program include a practicum or pre-practicum experience. Prior to working with children, students must pass a criminal background check. Northeast boasts an impressive placement rate; 99% of its graduates find jobs or continue their educations, with 83% doing so in a field related to their degree. Northeast Community College is regionally accredited by the Higher Learning Commission. Shoreline Community College ranks #9 on The 35 Best Online Associate's in Early Childhood Education Degree Programs! Shoreline Community College is a large, two-year school located just north of Seattle, Washington. It hosts an online associate in early education geared toward workforce entry. The program is comprehensive, containing 90 quarter credits, and fulfills the Washington State Department of Early Learning licensing standards for assistant and lead positions in licensed settings. Many graduates use this degree to secure assistant teaching positions at public schools. The curriculum of Shoreline's associate of applied arts and sciences in education: early childhood educator program emphasizes ethical practices and professionalism and includes 25 general education credits, 52 major-related credits, and 13 elective credits. Students can use their electives to concentrate on an area of particular interest; for example, they can earn certification in infant and toddler care. Shoreline delivers its web-based coursework asynchronously. Degree candidates also complete two internships and a practicum. Shoreline also hosts an associate of arts in early childhood education program intended for transfer students, as well as several certification options. About 41% of students attend classes online for at least part of their program, and 14% enroll exclusively as distance learners. The college's virtual campus is peer reviewed by Quality Matters, ensuring that it retains high standards. Shoreline Community College is regionally accredited by the Northwest Commission on Colleges and Universities. Liberty University ranks #10 on The 35 Best Online Associate's in Early Childhood Education Degree Programs! A conservative, Christian institution founded by Jerry Falwell, Liberty University has grown into the largest private, nonprofit university in the nation. The Lynchburg, Virginia-based school offers an entirely online associate in early childhood education degree that carries National Council for Accreditation of Teacher Education (NCATE) accreditation. This program's 60-credit curriculum develops teachers who understand the complexities of young learners, covering current practices in schools, evaluation methods, pedagogical theories and methods, and differentiated instruction. Liberty also requires students to take at least three classes in religion and theology, and many non-religious classes incorporate Christian components. Liberty's associate of arts in early childhood education online program divides its curriculum into 39 general education credits and 21 major-related credits. The core includes typical undergraduate requirements in math, literacy, communication, science, and the humanities, while early childhood classes explore educational principles, child psychology and development, child wellness, and classroom management. Liberty does not require students to participate in an internship, but many individuals decide to do so. Students engage in online learning asynchronously, taking classes in accelerated, eight-week sessions. Liberty requires degree candidates to keep a 2.0 GPA or better as they move through the program. The university has a generous transfer program, accepting up to 45 transfer credits; however, students must take at least 15 credits at Liberty. All prospective teachers must have their background cleared before entering classrooms with young children. Liberty's distance learners enjoy substantial tuition discounts compared to on-campus learners. Applicants must supply a high school diploma or the equivalent. Liberty is regionally accredited by the SACSCOC. Granite State College ranks #11 on The 35 Best Online Associate's in Early Childhood Education Degree Programs! Since being founded in the 1970s, Granite State College has focused on providing educational opportunities to adults and nontraditional students. Today, GSC accomplishes those goals through its popular online classrooms. This Concord, New Hampshire institution offers an array of web-based degree programs, including an associate degree in early childhood education online. GSC designed this program to prepare students to transition into four-year education programs. The curriculum provides a thorough understanding of young children, featuring coursework in creative arts, language and literacy development, exceptionalities, initial math and science, and family dynamics. GSC requires students to travel to campus for some classes. The 60-credit curriculum of this associate in early childhood ed program features 24 credits of core requirements and seven classes within the major itself. Professors conduct classes asynchronously, but distance learners have ample opportunities to interact with their classmates and form a strong community. The college accepts applications on a rolling basis, and students only need to submit proof of a high school diploma or a GED certificate. Transfer students make up more than 80% of the college's student body, and GSC endeavors to ease this transition. The school allows individuals to transfer as many as 44 credits into its associate programs, granting credit for work experience and military training through its prior learning assessment tool. Granite State is regionally accredited by the New England Association of Schools and Colleges (NEASC). Surry Community College ranks #12 on The 35 Best Online Associate's in Early Childhood Education Degree Programs! A comprehensive, two-year school in Dobson, North Carolina, Surry Community College offers an online early childhood education associate degree program appropriate for students who want to directly enter the workforce or pursue a four-year degree. Surry's curriculum features core content related to the cognitive, physical, and emotional growth and well being of young learners. Students learn to develop appropriate lessons, challenge young minds, and work with parents to build healthy learning environments. Graduates leave ready to work in preschools, child care centers, Head Start classrooms, recreational centers, nursery programs, and public elementary schools. Surry's online associate in early childhood education focuses on children from infancy to age eight. Students complete 67 credits to earn their diplomas. Full-time learners typically do this in four semesters by taking five classes at a time. A capstone project concludes the program; this experience emphasizes the creation of appropriate curriculum, supporting and engaging families, and modeling professional behavior. The college offers most classes asynchronously and expects distance learners to “attend” at least 85% of classes, which means participating actively in discussions and emails, taking quizzes, and completing assignments. Students new to virtual classrooms must complete an orientation seminar on the Moodle platform. Surry also offers an early childhood administration certificate. Surry Community College is regionally accredited by the SACSCOC. Clarion University of Pennsylvania ranks #13 on The 35 Best Online Associate's in Early Childhood Education Degree Programs! One of 14 schools in Pennsylvania's system of higher education, Clarion University hosts a virtual campus with a comprehensive array of internet-based degrees, ranging from the associate to doctorate level. Clarion designed its online associate degree in early childhood education to prepare entry-level professionals for work in the field of education. This associate track allows working people to earn their degrees in their spare time over a period of four years. Distance learners in Clarion's associate of science in early childhood education program complete 60 credits, half of which focus on educational core classes. Students learn how to develop appropriate programming for young children across a variety of subjects, including language and mathematics. They also build a foundation in child development and an understanding of how to create communities and engage families. Clarion offers classes in an asynchronous format, although students must also engage in field work at an appropriate setting. The school hosts several certification programs online, which graduates can use to augment their resumes. These offerings include early childhood director, skills for teachers, and gifted and talented certifications. Clarion also offers all web-based learners an orientation course to familiarize themselves with their cyber classrooms. Applicants must submit high school transcripts or the equivalent, and they may need to furnish standardized test scores. The university offers multiple ways for students to earn credits without taking courses, including credit by examination, prior learning assessments, and advanced placement scores. Clarion is regionally accredited by the Middle States Commission on Higher Education (MSCHE). Stanly Community College ranks #14 on The 35 Best Online Associate's in Early Childhood Education Degree Programs! Stanly Community College's online associate degree in early childhood education carries accreditation from the NAEYC. This Albemarle-based institution is one of North Carolina's 58 public, two-year schools. The college's early childhood education program uses the ASSESS (Appropriate Successful Strategies in Early Childhood Education using Standards to enhance Skills) conceptual framework, encouraging observation, documentation, assessment, and planning. Students integrate field experiences into many facets of their coursework, and Stanly requires prospective teachers to find a child care facility licensed at the three-star level or higher for their field practicums. The curriculum of Stanly's associate of science in early childhood education program consists of 68 credits and includes at least three education courses in each of its four semesters, as well as two during the summer term. Degree candidates can also pursue certificates in administration, infant/toddlers, school-age children, preschool, and social/emotional development. Most faculty members deliver coursework asynchronously. Before beginning their practicum experience, degree candidates must undergo a criminal background check; a drug test; and pass sensory, strength, and mobility examinations. All degree seekers must send in a copy of their high school diploma or the equivalent. Many applicants also need to submit to additional placement testing. Stanly has articulation agreements with several North Carolina colleges and universities. Stanly is regionally accredited by the SACSCOC. Northampton County Area Community College ranks #15 on The 35 Best Online Associate's in Early Childhood Education Degree Programs! Northampton County Area Community College offers more than 100 degree programs from its campus in Bethlehem, Pennsylvania. Among these is an early childhood education degree track. This NAEYC-accredited applied sciences degree equips students with the tools needed to move straight into paraprofessional positions in preschools and child care facilities or to transition into bachelor's programs that result in teacher licensure. The university established its 61-credit curriculum based on the precepts of Art as a Way of Learning, a conceptual early childhood framework developed in conjunction with Crayola. The program emphasizes art in the classroom, and Northampton integrates creativity into almost every course. Cultural sensitivity, ability diversity, and community building represent other focuses of the curriculum. Students in the early childhood education online associate degree program must maintain a “C” average as they progress through the curriculum. Individuals take an average of five classes per semester for four semesters, and most coursework is delivered asynchronously. A field experience is integral to the program, and degree candidates must have access to a digital camera to record their real-time classroom sessions. Northampton also offers certification programs, including those in leadership for early childhood program directors, infant/toddler development, school-age children, and child development associate. Applicants must submit a high school diploma or the equivalent. They must also furnish health records and submit to criminal, child abuse, and FBI background checks before admission. Distance learners in the early childhood program receive a discount on their tuition. Northampton is regionally accredited by the MSACS. Eastern Wyoming College ranks #16 on The 35 Best Online Associate's in Early Childhood Education Degree Programs! Located in the city of Torrington, Eastern Wyoming College is a small community college that hosts technical, vocational, and two-year degree programs to residents of Converse, Crook, Goshen, Niobrara, Platte, and Weston counties. EWC also offers a few online degrees, including an early childhood education associate degree. The college developed this program to ready preschool teachers for the workforce. Graduates may also go on to pursue bachelor's degrees and licensure; students can directly transfer to the University of Wyoming and Chadron State College, making it easier to earn a four-year degree. Eastern Wyoming requires students in its online associate of arts in early childhood education program to earn 60 credits. The four-semester program begins with a year of mostly foundational general requirements and then focuses on education classwork in the final two semesters. The curriculum concludes with a capstone course where students create portfolios. Most professors format their classes asynchronously, although some courses may require students to take proctored exams. Degree candidates also participate in internships. This program includes more than 20 elective credits in its curriculum, giving students the opportunity to tailor their degrees to fit their interests. The college also hosts an online associate in elementary education and a child development certificate. Applicants must submit proof of a high school diploma. Residents of many Western states pay half of the usual nonresident tuition cost thanks to the Western Undergraduate Exchange. Eastern Wyoming is regionally accredited by the North Central Association of the Higher Learning Commission. Dawson Community College ranks #17 on The 35 Best Online Associate's in Early Childhood Education Degree Programs! Set on the banks of the Yellowstone River in Glendive, Montana, Dawson Community College is a small institution with 450 undergraduates. However, the school also boasts a virtual campus, offering five programs online. Among these is an early childhood education online associate degree. The 60-credit curriculum gives students a solid foundation in the fundamentals of teaching young learners. Program participants explore pedagogy, child growth and development, guidance for toddlers, family issues, and helping exceptional kids. Individuals also take classes in leadership, professionalism, communication, and public speaking. Dawson's associate of applied science in early childhood education track follows a curriculum split between major-related requirements and general education coursework. Students take nine classes in early childhood education, six required foundational classes, and several electives from offerings that include basic first aid and CPR, developmental psychology, and children's literature. Students can also take internships and/or seminars in the field of pre-K education. Students at Dawson enjoy close relationships with their professors thanks to small class sizes; most of the asynchronous courses offered in the college's online associate in early childhood education program have fewer than 12 pupils. Web-based learners can also access several support services, including tutoring, tech support, guidance, and career services. Applicants must be over the age of 16 and provide proof of a high school diploma or the equivalent. Tuition at Dawson is the same for online and on-campus students. Dawson is regionally accredited by the Northwest Commission on Colleges and Universities. Fisher College ranks #18 on The 35 Best Online Associate's in Early Childhood Education Degree Programs! Boston-based Fisher College offers an online early childhood education associate degree program that combines theoretical and practical components. Students learn skills and ideas in their virtual classrooms, which they then apply in practicum settings, gaining the experience needed to work in a child care profession. Fisher's program provides a thorough education in the intellectual, emotional, and social development of children, and it satisfies requirements for teacher licensure in the Commonwealth of Massachusetts. Program participants should be sure to check the standards in the states where they plan to teach to see if this licensure is applicable to their needs. The program also meets the competencies of the National Child Development Associate Certificate. Students in Fisher's associate in arts in early childhood education program enroll in one of two tracks: traditional or director. The traditional track is the standard early childhood education route, whereas the director track is intended for degree candidates interested in pursuing leadership positions. Both concentrations require students to earn at least 63 credits. Most distance learners earn their degree in two years by taking classes in accelerated, eight-week sessions. Students should expect to devote 10-15 hours per course, per week. Fisher conducts all classes asynchronously, but students also engage in hands-on practicums in infant and toddler care and preschool education. Candidates should have a high school diploma or GED certificate. Everyone entering the early childhood education program must also pass background screening. Online students pay the same tuition as their on-campus counterparts. Fisher grants transfer credits for prior learning in some cases. Fisher College is regionally accredited by the NEASC. Georgia Military College ranks #19 on The 35 Best Online Associate's in Early Childhood Education Degree Programs! Georgia Military College designed its early childhood education associate degree track as a stepping stone to four-year degree programs. Students finish 99 quarter credits and complete many of the requirements needed for a bachelor's in education degree, including coursework in math, science, and writing. Additionally, they pick up transferable credits and skills in communication, time management, critical thinking, and leadership. The program also readies graduates for immediate paraprofessional work after they pass the appropriate exams. Located in Milledgeville, GMC is a military academy, but it's also a public, liberal arts community college with a firm commitment to online education. Students can earn every one of its degrees through the internet. Students enrolled in the school's associate of science in early childhood education program typically earn their degree after a year and a half of full-time study. Most professors deliver coursework asynchronously, but degree candidates also need to engage in field practicums, which they can complete close to their homes. The curriculum is broad and far more classes focus on foundational coursework as opposed to education; of the 99 quarter hours needed for graduation, only 15 concentrate on major-related coursework. English, math, and the sciences comprise most of the class requirements. The college has an open-admissions policy, and applicants only need a high school diploma or a GED certificate. Additionally, distance learners pay in-state tuition, regardless of their state of residence. Georgia Military College is regionally accredited by the SACSCOC. Haywood Community College ranks #20 on The 35 Best Online Associate's in Early Childhood Education Degree Programs! Located in western North Carolina, Haywood Community College is a medium-sized school offering technical and continuing education opportunities in the form of more than 50 degree programs. This institution hosts an array of distance programming, including an early childhood education associate degree online. The school established this program to equip students with the tools needed to work with children from birth through kindergarten. Core competencies include promoting healthy child development, creating challenging learning environments, and building family and community relationships. Most students earn their 72-credit associate of applied science in early childhood education degrees in two years. The program features three tracks: a traditional track, an administrator track, and a STEM track. The curriculum comprises far more education courses than many other programs, and students become well-versed in subjects like child development, health and nutrition, and educational technology. Non-major related coursework features community college fundamentals like college writing, math, and public speaking. Most courses follow an asynchronous format, although students interact frequently with their professors and peers. The college expects each student to commit 9-12 hours of study per course each week. Haywood uses the North Carolina Diagnostic Assessment and Placement Test to determine where students should begin their studies. All early childhood education candidates must also submit to a criminal background check and a urine drug screening. Haywood Community College is regionally accredited by the SACSCOC. Southwestern Community College ranks among The 35 Best Online Associate's in Early Childhood Education Degree Programs! A small, two-year school in Sylva, North Carolina, Southwestern Community College hosts an early childhood education program. This track — the school's most popular degree — is available entirely online. The 67-credit curriculum prepares students to teach children from preschool through their early elementary years, featuring classwork in child growth and development, health and nutrition, child behavior and guidance, and communication skills. Graduates leave with the ability to plan and implement useful curriculum in early childhood classrooms. Everyone begins this associate degree in early childhood education program with an orientation course before moving on to take introductory coursework. Most students take four or five classes per semester, and professors typically deliver their courses asynchronously. The curriculum slants heavily toward education, but students also take classes in writing, computers, health and safety, math, research, and psychology; these classes prove especially useful to learners who opt to pursue a bachelor's degree after graduating from this associate program. Students also participate in an early childhood capstone course at the end of their program, where they interact with small children in classrooms under the guidance of other instructors. This nine-hour practicum gives prospective teachers valuable experience in a dynamic teaching environment. The college features an open-admissions policy; applicants need only hold a high school diploma or GED certificate. Southwestern Community College is regionally accredited by the SACSCOC. Tallahassee Community College ranks among The 35 Best Online Associate's in Early Childhood Education Degree Programs! A large community college in the Florida city of the same name, TCC offers a range of web-based, asynchronous degree programs, allowing learners to pursue higher education at their convenience. The school teaches more than 37,000 students, 77% of whom graduate and move on to a four-year program. TCC's online associate degree in early childhood education takes students on a two-year journey through a 60-credit curriculum, preparing them to move into preschool classrooms and child care facilities. The program emphasizes leadership and features classwork in personal finance, technology, and management. The program may be particularly appealing to individuals interested in running their own child care operation. TCC's associate of science in early childhood education emphasizes major-related coursework. Two-thirds of the required credits consist of early childhood classes, with only 15 general education credit requirements. Students must earn a “C” or better in all communication, humanities, math, and science classes to meet Florida Board of Education requirements. Any participants interested in the Florida Child Care Professional credential must also complete a three-credit field experience. TCC's distance learners enjoy the same support as their on-campus peers. They have access to academic advising, the IT help desk, the career center, the library, and the virtual learning commons. Additionally, TCC is part of Florida's 2+2 articulation system, guaranteeing that students who earn an associate degree gain admission to one of the state's public four-year universities. Tallahassee Community College is regionally accredited by SACSCOC. Montgomery County Community College ranks among The 35 Best Online Associate's in Early Childhood Education Degree Programs! Montgomery County Community College offers a variety of popular online degree programs. This Blue Bell, Pennsylvania institution hosts an online early childhood education associate degree program that can be pursued largely in cyberspace. About 75% of the program's coursework is available online, typically in an asynchronous format. However, the remainder of classes require students to spend time on or near campus. Montgomery's average student is 25 years old, and the college created its associate of arts in education in the early years: birth through fourth grade program to prepare adults to work as teachers in child care settings. Additionally, many graduates opt to go on and pursue a four-year degree. The curriculum meets the core competencies and standards for Pennsylvania's public school articulation agreement, making it easier for students to transfer into bachelor's programs in the Keystone State. Participants take a mix of general education and major-specific courses, and the program typically concludes with a student teaching experience. Because this class requires faculty supervision, it is generally completed near campus. The college grants credit for work experience through prior learning assessments. Students in this program must have their backgrounds checked for child abuse and criminal activity. Applicants should submit their high school transcripts or GED certificate and standardized test scores (or sit for Montgomery's placement exam). Montgomery County Community College is regionally accredited by the MSACSS. Hagerstown Community College ranks among The 35 Best Online Associate's in Early Childhood Education Degree Programs! Located in northern Maryland, near the Pennsylvania border, Hagerstown Community College offers several online programs in early childhood education. Future teachers can select from a certificate program, an applied science degree with a career orientation (AAS), or an associate of arts program that enables learners to seamlessly transfer to a four-year college (AAT). The school's division of education also sponsors associate degrees in education and special education. The curriculum combines college core classes, practical early education courses, and real-world field experience. Most coursework is available online in an asynchronous format, but Hagerstown does require visits to campus for some classes. The college's applied science degree in early childhood and primary grades education is a 60-credit program designed to prepare teachers to step into lead roles in a child care/preschool setting or work as an assistant teacher in an elementary classroom. College core classes comprise about a third of the credits. The remaining major-related requirements include classes in child development, educational psychology, and child care center administration. Additionally, program participants complete an internship. The associate of arts transfer track also requires 60 credits for graduation but allocates more of the curriculum to general education requirements in the arts, humanities, and math and sciences. Students have the opportunity to participate in 45 hours of field experience. Degree candidates in the AAT program must finish with a GPA of at least 2.75, submit a professional portfolio, and earn a passing score on on a basic skills test of high school level reading, writing, and math to take home their diplomas. Hagerstown is regionally accredited by the MSACS. Richmond Community College ranks among The 35 Best Online Associate's in Early Childhood Education Degree Programs! Part of the North Carolina system of community colleges, Richmond Community College is based in the small, southern city of Hamlet. The two-year school has expanded its virtual campus since 2010, increasing its web-based offerings by 78%; internet instruction now makes up about a third of the school's teaching time. Richmond hosts an early childhood education associate degree online that prepares graduates to work with children from birth through age eight in preschools, child care centers, Head Start programs, public schools, and other facilities. It also provides useful general education credits, which can serve as a platform for a four-year degree. Richmond devotes most of its 65-credit associate of applied science in early childhood education curriculum to major-related coursework, giving students a strong background in subjects like child development; child guidance; health, safety, and nutrition; and children with exceptionalities. Degree seekers also fulfill 14 credits of electives, giving them the opportunity to concentrate in certain areas (e.g., special education, classroom management, or very young children). All students complete a capstone project, and individuals can take an elective course that readies them for the Praxis exam. The school requires a criminal background check for anyone working in classrooms with young children. All of the program's required classwork can be completed online asynchronously. The college has articulation agreements with several public universities in North Carolina, guaranteeing successful transfer for students who maintain a GPA of 2.0 or better. Richmond is regionally accredited by the SACSCOC. 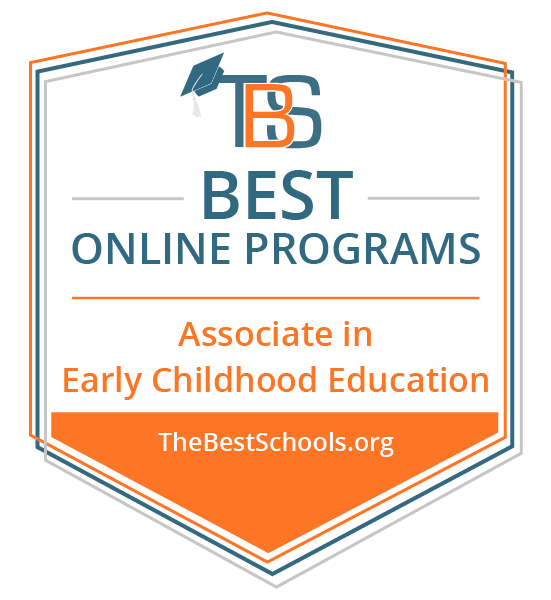 Georgia Piedmont Technical College ranks among The 35 Best Online Associate's in Early Childhood Education Degree Programs! One of the oldest of Georgia's 33 technical schools, Georgia Piedmont Technical College is among the nation's few colleges that offers an educational guarantee; if an employer finds a graduate of one of the college's standard programs deficient in a core competency, the Clarkston-based school will readmit the employee for free to get them up to speed. This includes graduates who earn the college's online early childhood education associate degree. This 72-credit program offers a number of specializations. Degree seekers choose one of five potential tracks: paraprofessional, administrative, infant/toddler, school-age youth care, or early childhood exceptionalities. Georgia Piedmont offers most of its programs online in an asynchronous format, allowing students to log in and complete coursework at their convenience. The curriculum of the associate of applied science in early childhood education program consists of six core college courses in math, writing, psychology, and public speaking, as well as 13 major-related classes. Two additional classes comprise the specialization track. The school also requires each student to complete a 12-credit internship in a local classroom under the guidance of a teacher/mentor; the exceptionalities concentration features additional in-class time. No matter their specialty, graduates leave the program with the skills needed to work in child care settings, preschools, Head Start programs, and in elementary school paraprofessional positions. GPTC has an overall placement rate of 98%. The college accepts students over the age of 16 with a high school degree or GED certificate and satisfactory scores on the SAT, ACT, or COMPASS placement test. Georgia Piedmont is regionally accredited by the SACSCOC. Great Basin College ranks among The 35 Best Online Associate's in Early Childhood Education Degree Programs! With a main campus in Elko, Nevada, and several more facilities spread across the Silver State, Great Basin College hosts more than 30 degree and certificate programs on its virtual campus, including an early childhood education online associate degree. This program works to promote a sense of community, help families, raise cross-cultural awareness, instil professional behavior, and encourage curriculum development. GBC created its program to train future preschool teachers, child care workers, paraprofessionals, and homecare providers. The 60-credit curriculum emphasizes the “early” in early childhood and includes much coursework in early care, early language development, and infant/toddler skills. The college also offers an associate of arts program in early education, which is better-suited for individuals interested in going on to pursue a four-year degree. Full-time students in GBC's associate of science in early childhood education program typically earn their degrees in two years by taking four or five classes per semester. GBC conducts its virtual courses asynchronously. The college built its curriculum around seven general education classes, four courses in the program core, and four electives. Participants also fulfill a six-credit student teaching requirement. One of the eight institutions in the Nevada System of Higher Education, GBC has an open-admissions policy; applicants need only have a high school diploma or GED certificate to gain admittance. Nonresidents pay a modest additional tuition fee for web-based courses. Great Basin is regionally accredited by the Northwest Commission on Colleges and Universities. NHTI-Concord's Community College ranks among The 35 Best Online Associate's in Early Childhood Education Degree Programs! Opened in the 1960s as the New Hampshire Technical Institute, NHTI is now also known as Concord's Community College. Located in the state's capital, the school's main campus houses a state-of-the-art facility dedicated to early childhood care and education: the Child and Family Development Center (CFDC). NHTI's associate degree in early childhood education is also available entirely online. The program follows a 60-credit curriculum and produces thoughtful educators who teach young children through interactive learning and play. NHTI's coursework follows the standards of the Guidelines for Early Childhood Education Programs in Associate Degree Granting Institutions, as established by the NAEYC. Its rigorous course of study features two practicums, development of a portfolio, and a leadership seminar. All online students must have access to a digital camera to document their labs and field experiences. Distance learners in the Concord area can complete lab work at the CFDC, while others can find a more local option (preferably at a licensed child care center accredited by the NAEYC). Students must follow the appropriate child care protocols, such as background checks, fingerprinting, and healthcare requirements, of the state in which they live and work. New Hampshire residents and members of the New England Regional Student Program pay substantially lower tuition than students from other states. The school requires degree candidates to take a placement exam or furnish scores from a standardized test (e.g., the SAT or ACT) prior to enrollment. NHTI is regionally accredited by the NEASC. Minnesota State College - Southeast Technical ranks among The 35 Best Online Associate's in Early Childhood Education Degree Programs! Minnesota State College Southeast believes that the development and cognitive growth of children is directly related to the educational level of their child care providers. Therefore, this Winona-based institution strives to provide child care providers with exceptional educations. The school hosts multiple online early childhood education associate degree programs, as well as certifications and a 32-credit diploma option. Students can select from two associate options: an associate of applied science that helps lead directly to employment or an associate of science aimed at students who want to subsequently transfer to a four-year program. Each of these tracks provides a thorough grounding in both theory and process-oriented education. Additionally, all programming stresses ethical practice. Degree seekers in each program accumulate 60 credits, although the number of general education credits needed for a diploma differ. Both tracks also require students to compete practicums in the field. Distance learners can complete these locally, and full-time students typically finish their studies in two years. Graduates leave with a professional portfolio, developed to standards set by the NAEYC, which demonstrates what they've learned in the program. MSC Southeast keeps class sizes low, with an average of 15 pupils per class, to ensure ample interaction between students and faculty. Professors deliver coursework asynchronously. 100% of MSC Southeast's early childhood graduates find a job in their field of choice. Distance learners pay the same tuition as Minnesota residents, although the school does charge online students a small additional fee. MSC Southeast is regionally accredited by the Higher Learning Commission. Central Texas College ranks among The 35 Best Online Associate's in Early Childhood Education Degree Programs! Central Texas College has offered long-distance educational opportunities for decades. In addition to campuses across a 12-county area in the Lone Star State, this Killeen-based school delivers classes to more than 100 Army bases around the world. More than 50% of CTC students now attend class on the school's virtual campus. The college offers an early childhood education associate degree online program that prepares teachers for preschool, early elementary, and Head Start classrooms. Distance learners earn an associate of applied science in child development degree and an administrator's credential certificate that can help them find work in management positions. The 60-credit curriculum addresses a range of areas in early childhood development, including child guidance, children with special needs, literacy, and behavioral science. Students also fulfill 15 credits of general education requirements in composition, math, science, physical activity, and humanities or fine arts. CTC delivers online classes asynchronously through the Blackboard learning management system. Students must also complete a practicum and an internship experience. Central Texas College is a public, open-admission school; applicants need only submit proof of high school graduation to gain acceptance. Additionally, CTC has articulation agreements with many universities across the country, simplifying the application and transfer process to a baccalaureate program for students who want to go on and earn a four-year degree. Central Texas College is regionally accredited by the SACSCOC. Bay Mills Community College ranks among The 35 Best Online Associate's in Early Childhood Education Degree Programs! Located alongside Lake Superior in Michigan's Upper Peninsula, Bay Mills Community College is run by the Bay Mills Indian community. The tribe founded the college to provide educational opportunities to its own people, but the school has grown into a Higher Education Commission-accredited institution open to anyone with a high school diploma. BMCC offers an online associate in early childhood education designed to prepare instructors for Native American Head Start programs. Focused on community and family, the program follows a 62-credit curriculum that teaches students about the cognitive, social, emotional, and physical development of children from birth to age five. Graduates depart with the skills required to manage a daycare facility or preschool, as well as the foundational credits needed to transfer to a four-year school. BMCC's online associate of arts in early childhood education features major-related classes as well as coursework in computers, composition, social studies, math, and science. Program participants also take courses in Native American culture in each of their first two semesters. They may also select a class on the Ojibwe language to help meet communication skills requirements. Most courses run asynchronously on a 15-week schedule, although some classes use weekly, scheduled chat sessions. BMCC accepts transfer credits earned with a “C” or better, but students must complete at least 60% of credit requirements at the school. Prospective teachers may also enroll in BMCC's eight-credit certificate of completion program. Bay Mills Community College is regionally accredited by the Higher Learning Commission. Fayetteville Technical Community College ranks among The 35 Best Online Associate's in Early Childhood Education Degree Programs! A large, two-year school in Fayetteville, North Carolina, FTCC specializes in vocational, technical, and transfer programs, offering more than 200 degrees and certificates. The school hosts many of its programs on its virtual campus, including an associate degree in early childhood education. Participants in this program learn the basics of child development, both in theory and in real classroom settings under the supervision of faculty. Graduates become teachers who can foster the intellectual, physical, and emotional growth of young learners. FTCC's high standards earned the program accreditation from the NAEYC. FTCC's associate in applied science in early childhood education requires a total of 64 credits, typically spread across five semesters. However, full-time students can earn their degree more quickly if they participate in a summer session. Distance learners fulfill community college general education requirements in English, math, computers, science, and the humanities, and take about a dozen courses in the major itself. The program also features a capstone practicum, which students typically complete during their final term. Classes use an asynchronous format, providing students increased scheduling flexibility. Applicants should hold a high school diploma or the equivalent and submit their placement test scores. They must also provide proof of a criminal background check, health insurance information, and results of a physical examination. FTCC also offers an online associate in school-age education and certificates in child care development, administration, lateral entry teaching, special education, and professional child care. FTCC is regionally accredited by the SACSCOC. Front Range Community College ranks among The 35 Best Online Associate's in Early Childhood Education Degree Programs! Front Range Community College is Colorado's largest two-year school and the number one transfer institution for many of the state's public, four-year universities. Located just west of Denver in the city of Westminster, FRCC holds a strong web presence with more than 35% of its 20,000 students enrolled in one or more online classes. The college designed its early childhood education associate degree as a transfer program, preparing graduates to go on and pursue a bachelor's degree. However, this program also holds accreditation from the NAEYC and qualifies prospective teachers to work in preschool-third grade classrooms. Most students take 15 credits a semester for four semesters. The curriculum slants toward the accumulation of transfer credits; according to the degree plan, participants may spend whole semesters without taking any major-related coursework. Students interested in moving straight into the profession may want to consider FRCC's associate of applied science in early childhood education. Front Range keeps class sizes small, with an average of 17 pupils per course, and most professors deliver coursework asynchronously. The program aims to produce teachers who can build a sense of community across cultures and nurture the educational growth of young learners. The curriculum is student-focused and emphasizes research, competency, and professionalism. Nonresident online learners at FRCC enjoy a substantial discount over on-campus students. Most of the school's general education courses have a transfer guarantee. The Westminster institution is truly open admission and even offers classes to help individuals earn a GED certificate. Additionally, FRCC offers certification programs in foundations of early childhood education, infant/toddler supervisor, early childhood education for paraeducators, and early childhood director. FRCC is regionally accredited by the Higher Learning Commission. Colorado Northwestern Community College ranks among The 35 Best Online Associate's in Early Childhood Education Degree Programs! Colorado Northwestern Community College is a small school with campuses in the communities of Rangely and Craig. The school also hosts a virtual campus, which offers an online associate degree in early childhood education. This program combines asynchronous learning with weekly online meetings scheduled for the same evening each week from 6-9 p.m. Students enroll in a cohort and progress together through CNCC's 60-credit curriculum. The school established its coursework based on the child care requirements of the state's Department of Human Service's Division of Childcare. Coursework may include lectures, discussions, group activities, and observation of preschool classrooms. Distance learners enrolled in CNCC's associate of applied science in early childhood degree track must fulfill 15 credits of general education, 36 credits in the major itself, and nine elective credits. Students also have the option of adding two occupational certificates to their resumes in early childhood professions director (30 credits) and early childhood teacher (12 credits). Cohorts typically number 6-15 individuals, allowing degree seekers to develop a strong network of support among their peers. The college does not require letters of recommendation or essays for admission; applicants need only submit proof of a high school diploma or the equivalent. Colorado Northwestern Community College is regionally accredited by the Higher Learning Commission. Gulf Coast State College ranks among The 35 Best Online Associate's in Early Childhood Education Degree Programs! Gulf Coast State College, based on the waterfront in Panama City, Florida, has a popular virtual campus that offers a full slate of distance programs. Students at GCSC can earn an associate degree online in early childhood education. The program provides students with a thorough education in pedagogy, from infancy to age five, and prepares individuals for managerial positions, teaching jobs, and caregiving responsibilities in preschools, child care centers, rec programs, and Head Start classrooms. Graduates leave with a Florida Childcare Professional credential in addition to their degree. This program uses a hybrid format; most online learning occurs asynchronously, but students also participate in three face-to-face class meetings per course. GCSC's 60-credit associate of science in early childhood education program gives students a broad-based education in child growth and development, program and lesson development, social and emotional growth, guidance, language and literacy, and creativity for young learners. Distance learners gain practical experience in classrooms working with children, putting in the hours necessary to secure credentials and future employment. Individuals also earn credits that can transfer to other universities. Gulf Coast participates in the Florida Shine program and the Southern Regional Education Board's Electronic Campus, both of which allow GCSC students to take courses at other institutions, greatly expanding their educational options. Applicants must provide proof of high school completion and pass a Level 2 background check. Candidates who have not taken the SAT or ACT must sit for the Florida College Placement Test. Gulf Coast is regionally accredited by the SACSCOC. After earning an online associate degree in early childhood education, you may decide to continue your education by earning a bachelor's. Some schools may require their employees to hold at least a bachelor's degree, especially if they are teaching kindergarten or higher grades. Graduates with a bachelor's degree can hold leadership positions, increasing their salary potential and gaining access to benefits such as employer-paid healthcare. The three degrees below represent only a handful of your potential educational paths. Bachelor's in Early Childhood Education: The courses in a bachelor's in early childhood education program go more in-depth than an associate program. These programs may prepare you to earn teacher licensure in your home state, qualifying you to work in a public elementary school. Bachelor's in Early Childhood Education with Montessori Education Concentration: The Montessori method has revolutionized the education of young children by focusing on a child's natural curiosity and emotional development. Montessori teachers receive specialized training during their teacher education programs, qualifying them for both the regular education and Montessori classroom settings. Bachelor's in Physical Education: A child's physical development is just as essential as their intellectual and emotional development. Physical education programs may satisfy the requirements for teacher licensure in your home state, opening you to more career opportunities and a higher salary.